Go into any department store today and you'll find big chunky beaded jewelry at high prices. You can make your own department store fashion statement at a fraction of the price using, of all things, potatoes. 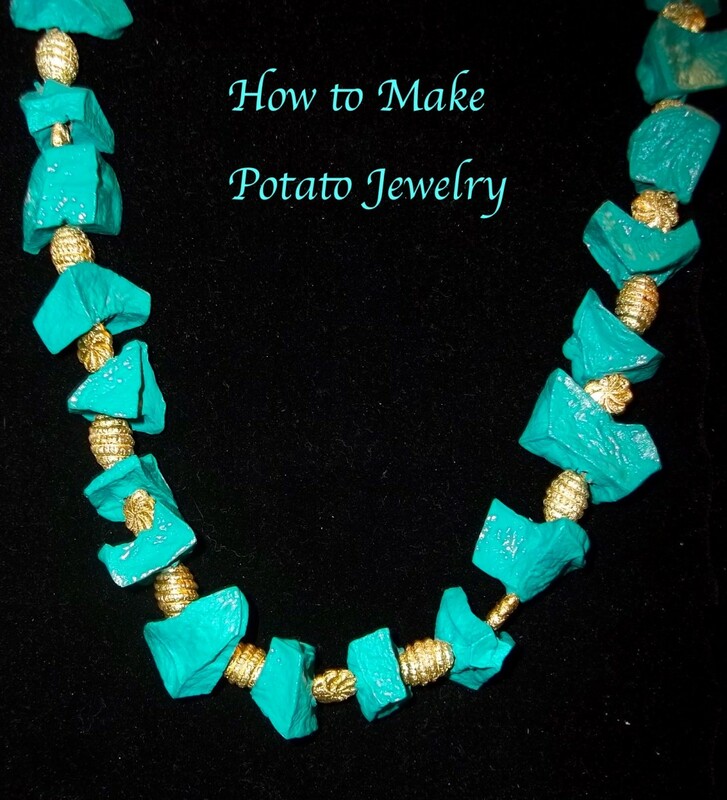 Making jewelry out of potatoes is a fun and simple craft that is great for all ages. 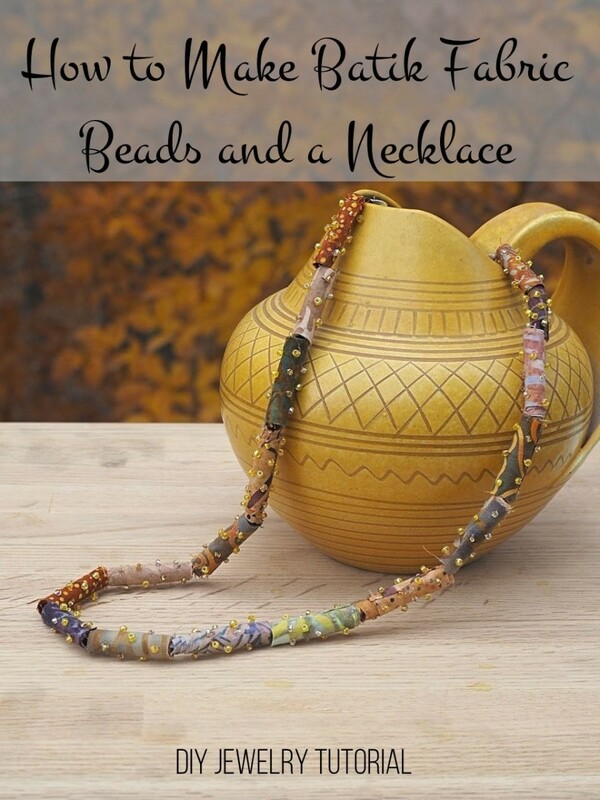 From the first step of making the potato beads, to the resulting gorgeous piece of jewelry, you are sure to surprise friends and family when they discover that the necklace you just gave them is made out of the same thing they find on their dinner plate. Because you'll need plenty of time to prepare, this is the perfect craft for people that help out in a class regularly, like sunday school or a weekly senior group. Make sure to allow yourself at least 3 classes, or 2 weeks, for this project. 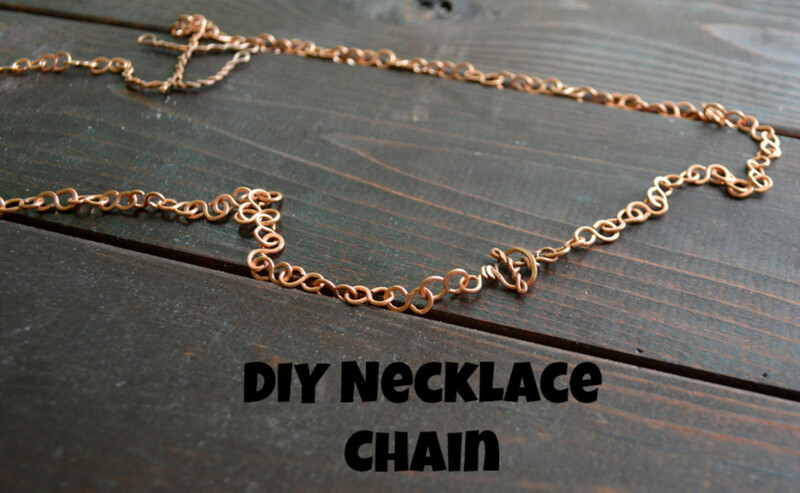 With a few inexpensive supplies you'll be making jewelry out of potatoes in no time. You will need about 2 weeks to complete the process of making the potato beads. Cut the potatoes to the desired size. For this demonstration I cut approximately 1 1/2" chunks. This size made large chunky beads. Note that the potatoes will shrink by at least a third, so if they are cut too small, they will break easily. Put the potatoes on the bamboo skewers and place them on wax paper covered baking sheets or another surface. Use a portable surface so they can be moved easily. Put the skewer filled trays in an out-of-the-way spot and let them dry for at least 10 days or up to 2 weeks. Important: Give each potato a twist on the skewer every day to prevent it from sticking to the skewer. Once they have dried completely and feel as hard as rocks, they are ready to paint. Leaving the potatoes on the skewers and using acrylic paints, paint each bead, making sure to cover the entire surface of the potato. Give the potatoes a second coating of acrylic paint and let dry overnight again. Once the painted potatoes are completely dry, spray them with an acrylic sealer spray. Do this step outside or in a well-ventilated area and keep kids away! Allow the finished beads to dry overnight. Take the beads off the skewers. Some may be tough to remove and there will be a few that break. The potato beads are ready to use. 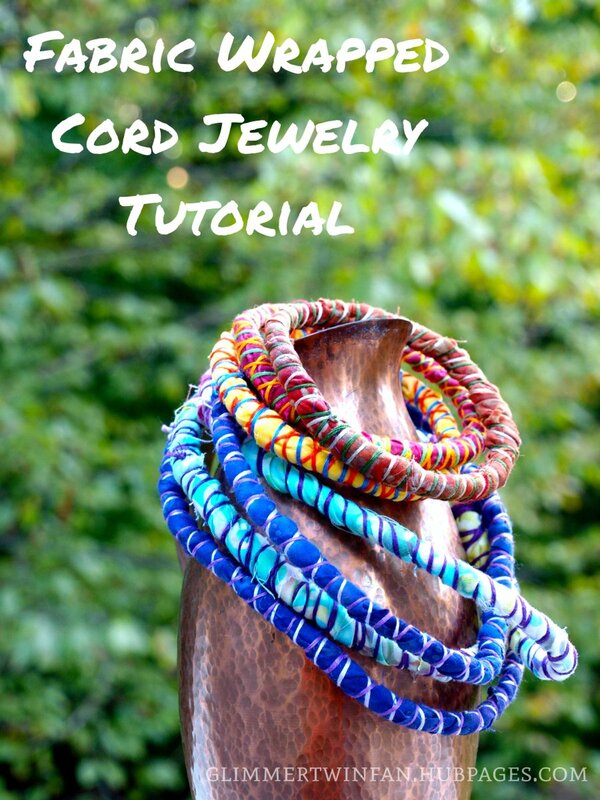 Making a necklace with potato beads is easy and takes no time at all. 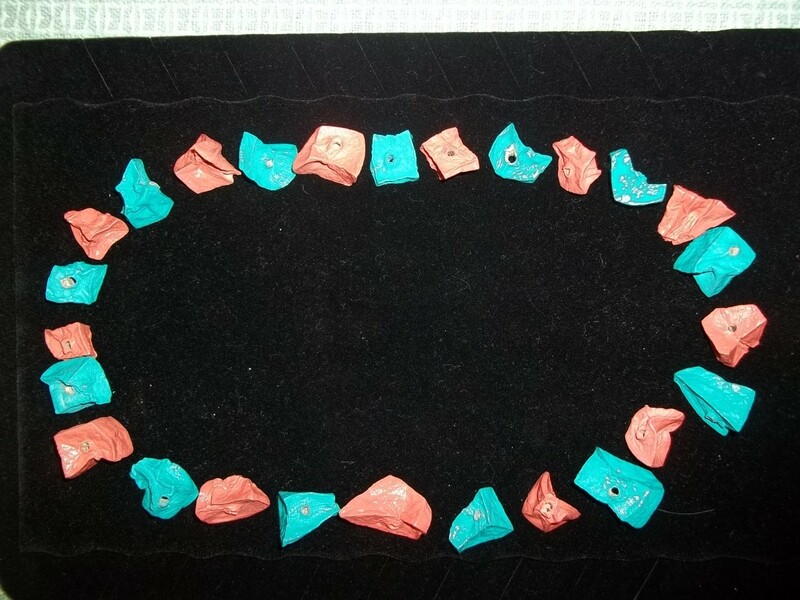 Using any surface, start by laying out your beads in a design. 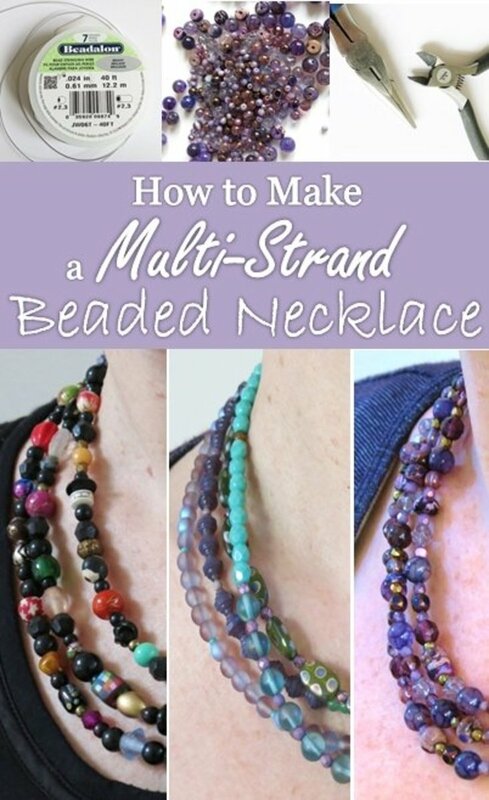 Add other types of beads for a different look. Once you are happy with the look, it's time to start beading. Thread a large embroidery needle with your desired thread. For this necklace I used embroidery floss. I always cut an extremely long piece of thread so that there is plenty of extra length for knotting. I would not recommend using elastic thread for a necklace. The bead weight will stretch it out as it hangs around the neck. 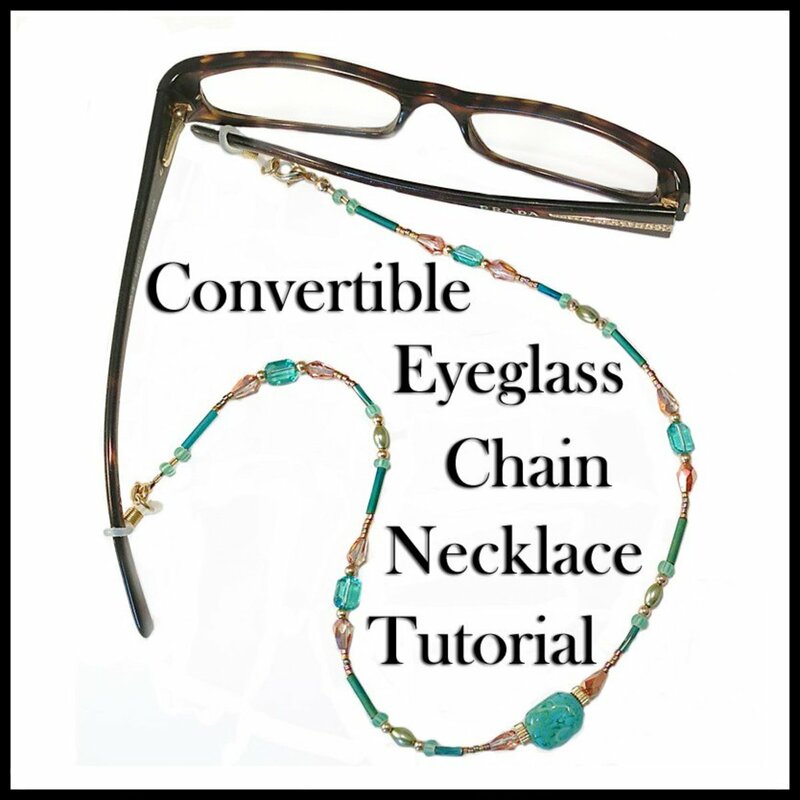 The necklace in this demonstration is long enough to fit over a head, but if you want a shorter style, like a choker, then you'll need to affix a necklace clasp to the ends of the string. 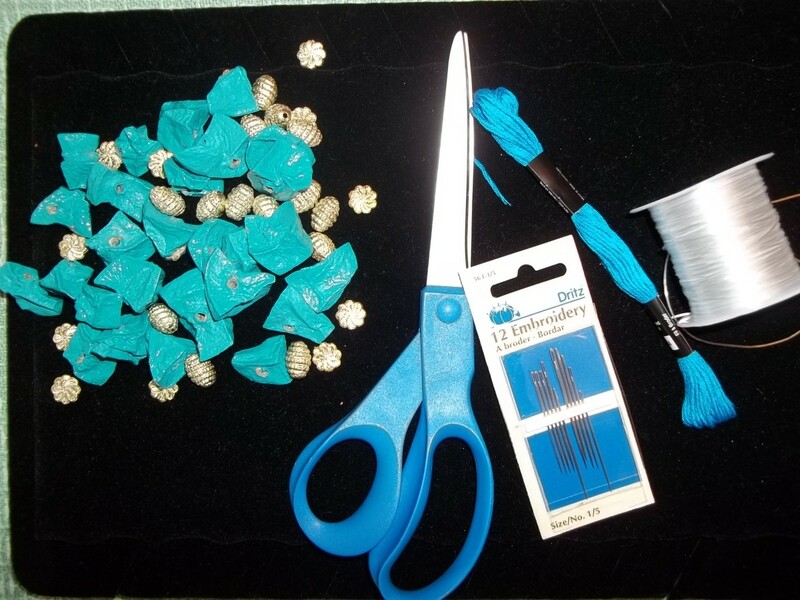 When finished beading, remove the needle from the thread and tie a knot. Make sure to tie the knot close enough to the beads so it disappears in the beading. This ensures a seamless finished look. Once you have the first knot tied, tie a few more for safe measure. Slip the necklace on and admire your handiwork! * To make a bracelet, follow the above steps, but instead of using embroidery floss, I suggest using elastic thread. It makes it much easier to slip over the wrist and makes the bracelet more comfortable for daily wear. 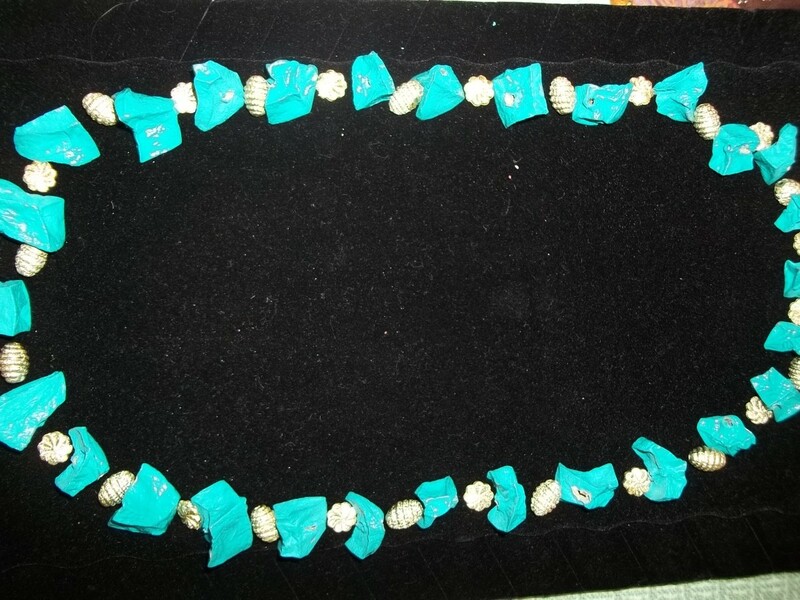 As with the necklace, a clasp can be added instead of knotting. It is your personal preference. Make sure your needle fits through all of your different bead sizes. 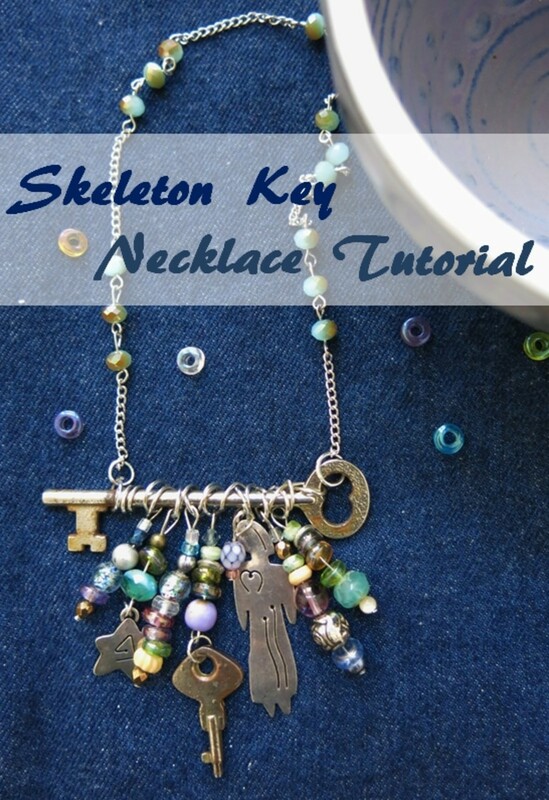 Don't disassemble your bead layout once you have chosen it. 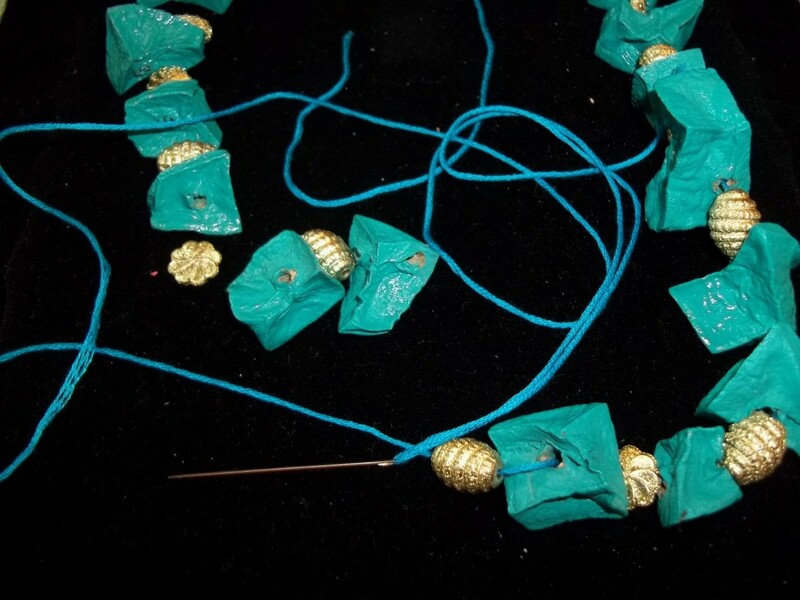 Before tying the knots in your necklace, make sure it will fit over your head. If not, add beads or a necklace clasp. Tie at least 3 knots for safety and add a dab of glue on the knot for an extra hold. I know, it doesn't make any sense, but it works. It does take time though. But the results are always interesting and definitely unique! I would never in a million years have thought of using potatoes to make beads. This is super cool. Thank you for sharing this craft. I love it. Hi lbrummer - Glad you think this project is interesting. I agree and it's not everyday we can tell someone we are wearing potato jewelry! Now if I could only figure out how to turn potatoes into diamonds (just kidding) !!!! Thanks for stopping by and reading. Have a great weekend! Very interesting. This looks like a project anyone could enjoy. Thank you JessicaBarst. It might be a bit difficult to do ovals, but it would definitely be fun to try. 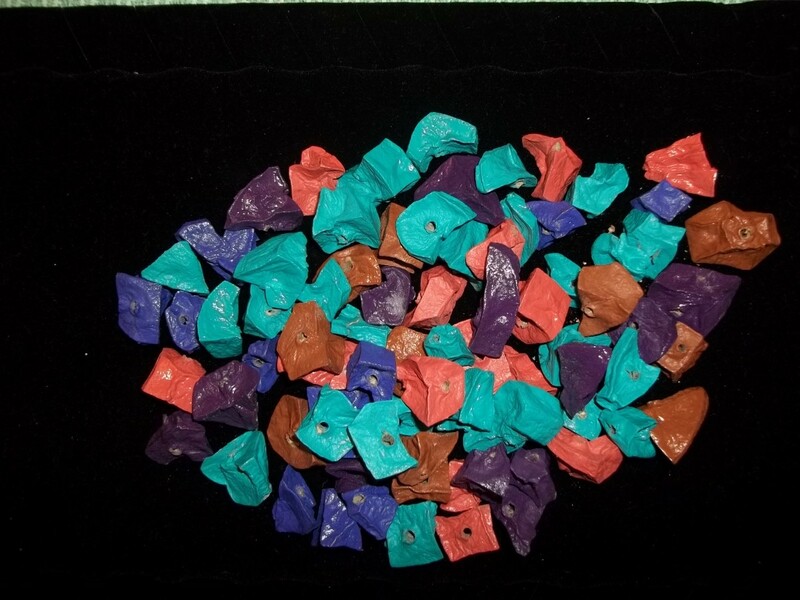 As they dry the shapes change, wrinkling and shrinking, but it would be worth it to see what they look like. Glad you enjoyed the hub and appreciate the comments. Oh how cool! I wonder if it would be too difficult to shape them into rounds and ovals? (Do I have enough patience for that??). What a lovely comment Dclark. I'm so glad you found this recipe and I hope you create some lovely pieces out of the potatoes. I still get people who are skeptical, but then they think it is really cool. Thank you for reading and commenting. In the '70's my family moved to WA and my sister that lives here was wearing a necklace one day and I complimented her on it. She said she had made it, I ask her what types of beads they were and she said, "Potato beads". I tried and tried to get her to tell me the truth about the beads, and she kept insisting they were "potato beads". I've been dabbling in jewelry making for several years and I kept thinking about "potato beads", my sister passed away 1 1/2 years ago and I did not get the recipe. Thank you so much for sharing your recipe. I will be making them as soon as I get back from the grocery store. Thanks so much agusfanani - You are right. Jewelry like this is really expensive in the stores. This could save a lot of money! I appreciate the comments. Considering the expensive prices of those beaded jewelries at the malls, I think you've given a breakthrough in this potato jewelry. This really a great idea. Vote up.. Thanks azrestoexp! Glad you liked it and hope you have fun trying it. It is definitely fun to do and everyone gets a kick out of it. This is the coolest thing ever!!! And I thought I was so smart. So excited, I can't wait to try this. Voted up. I appreciate it Marian Designs. A few weeks ago I saw a potato necklace on someone and the woman was surprised that I knew what it was. They were really are conversation starters. Thanks for the nice comments. Wow, I would never in a million years have thought of making jewelry from potatoes. But it looks great. You've done a great job with the photos and video. Enjoyable, to say the least. I appreciate it NornsMercy. Give it a try if you get a chance. It's loads of fun. Thanks so much for the kind comments Tracy. This hub always surprises people! Thanks prettynutjob30. I hope you give it a try. Hi Eccentric-Lhee - I am definitely checking out your hub. I've never heard of orange peel jewelry. Glad you enjoyed this hub and thanks for commenting. Thanks so much Just Ask Susan! It really is fun and people always want to know where they can get some pieces. Very interesting! I would have never imagined making potato beads. Great explanation and images! Great hub, voted up, more and shared, this is really pretty. This is great, I have a hub on orange peel jewelry, never thought of using potatoes though, great hub, voted up! I've never seen anything like this before. Very interesting and the results are beautiful. I know a lot of people that would love to try making potato jewelry and I'll be sharing your hub as well as pinning it. Thanks vibesites! I hope you do give it a try to enjoy it. It is totally fun and unique! It's unimaginable that potatoes can be made into jewelry! Very creative, I would like to try my hand on this. This is might be the best way to start a conversation. Voted up and interesting. Thanks so much rajan. This is such a conversation craft. Wear a necklace like this and it is sure to be a conversation starter. This is both creative and very attractive. If I had just seen and not read about it I would have known it was made of potato. Voted up, useful and beautiful. Shared and pinned. I appreciate the nice comments livingsta. It really is a fun and unique craft. Wow, what a creative idea. I looked at the title and thought, how this could be possible. This is so beautiful. Looks very pretty too. Voted up awesome and interesting. Sharing, pinning and tweeting! Thanks so much Michelle. I appreciate it. This is fun and creative, Glim! Way cool! Thank you Kathryn - I hope you get a chance to give it a try. It really is a lot of fun. Thanks so much. These are always fun to wear and tell people about because they never believe they are potatoes. Wow! This is really different and the jewelry is so attractive. Thanks for sharing. That is so cool! I have never thought of turning potatoes into beads. I may try it sometime! Thanks for sharing this with us. Thanks so much Daisy! I just wore the turquoise one the other day. My grandmother always said that potatoes were the perfect vegetable, but I bet she never knew she could make jewelry from them! I appreciate the comments and the share. Thanks for publishing this article. What a clever idea! I've used potatoes in printmaking and as stamps, but not in jewelrymaking. I'm going to have to try this. Thanks so much MixedKreations. When I first tried this I thought they would rot too, but they definitely don't. Glad you enjoyed the hub. How neat. I never would of dreamed of making jewelry out of potatoes. I would of thought that they would rot. I will have to give this a try. Your's turned out so lovely! Thanks savingkathy! It's just one of those weird projects that turns out really nicely. It's also a great conversation starter at parties. I appreciate your comments. Wow. I never would have guessed those beads were made with dried out potatoes. What an interesting idea. This looks like a fun project for kids. Thanks for providing such easy-to-follow instructions. The photos and video are great! Thanks so much drosostalitsa! I'm glad you enjoyed the hub and hope you give it a try. Great idea! Jewelry making is so fun, especially when using unusual materials. Thank you for sharing. I am definitely going to try this. Cathy - I hope you give it a try. It is loads of fun and people get such a kick out of it. Thanks for visiting. Wow, this is a first for me, I have never heard of potato jewelry but it looks like fun and is beautiful. Thanks! Thanks so much Sherry! It's always fun to see a reaction when I tell someone what it is made of. It's hard to believe those lovely necklaces are made from potatoes. Amazing. I appreciate it Mary. My daughter had a blast doing this and it's always fun to tell people your jewelry is made out of potatoes! They never believe it. This is so awesome. 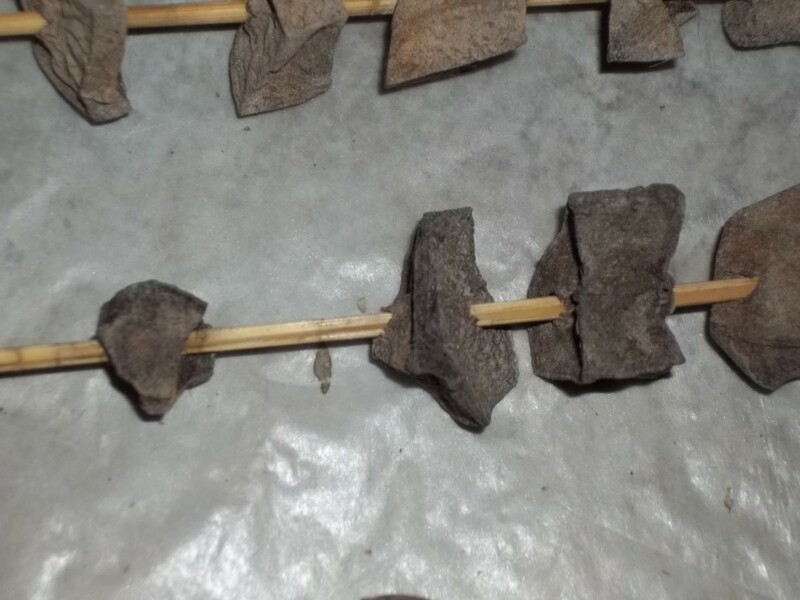 I had no idea that potatoes could be dried out and used in different ways like this. I'm actually pretty excited about the idea of trying this out. It would also be a super great craft for kids to do. Hi Au fait - I think it would a great thing for kids to give as gifts. Everyone loves homemade things. Thanks for visiting! Have never heard of this before. Sounds very interesting and just in time for Christmas so the kids can make their own presents. Thanks so much 2besure! It still amazes that these pieces are made of potatoes and I wear them! I appreciate the visit! When I saw the title of this hub, I just had to read it! Nothing is impossible. 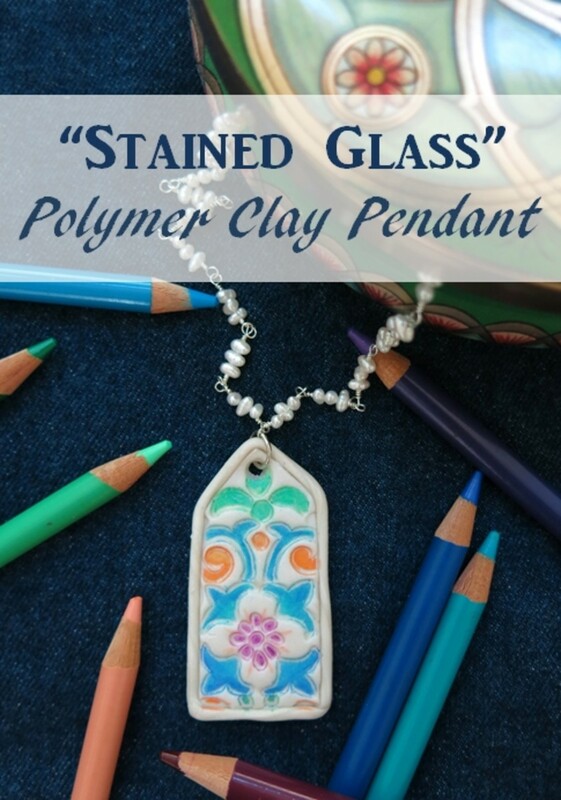 What a creative way to make beautiful jewelry and create a conversational piece! Vote up! Thanks Enelle Lamb! It's a lot of fun. Great idea! I might just branch out from wire wrapping to potato beads! Thanks for sharing this! Thanks so much frogyfish. I would think that drying in the oven, no matter how low would actually cook them, but give it a shot. You never know. Someone else asked about a dehydrator. I imagine that that method might work better. I appreciate the comments. Absurdly fantastic and beautiful! Will have to try your process soon - but couldn't I speed it up by drying slowly in an oven? This is totally unique, so thanks for your sharing here. Thanks Margarita! It is amazing and people never believe me when I tell them it's potatoes! Great icebreaker if you are somewhere where you don't know a lot of people! Amazing! I learn something new everyday, I had no idea you could do something like this with potatoes! I appreciate it recappers. My daughter who is 9 really enjoyed it although she was a little impatient waiting for the potatoes to harden. Thanks vespawoolf! My daughter really enjoyed it and had fun designing jewelry. I appreciate the vote! This is a great idea, and so eco-friendly as well. With potatoes being so cheap and abundant here, I think it would be a fun project to tackle with my friends and their families. The kids would have a great time painting and stringing the "beads". Thanks so much...voted up! This is a neat hub. I am going to show this to my daughter. I think she might enjoy doing this. I appreciate the comments lcbenefield! I hope your niece enjoys the jewelry. Pringoooals - I hope you enjoy this craft. It's loads of fun. Thanks for commenting. Thanks so much Jamie! I think they would look great with glitter or they also have that metallic acrylic paint which would probably look great too! How fun! I cannot wait to try this! I would have never thought of using potatoes for jewelry. One of my nieces loves to make jewelry. She will go nuts for this idea. Thanks for shaing this. How original! What a great idea. Potatoes are always available and such a great fun for the kids! I'am going to try it! I have never heard of making potato jewelry.. what an awesome idea! I guess when they are dried out, they are kind of like flowers that have been dried out? Thank you so much for such an awesome tutorial!! I could see maybe even adding some pretty glitter to them or wonder if you could dip them in resin to make them even more durable though they sound pretty durable already. Great hub, voting up!! Thanks so much for your support ishwaryaa! I appreciate the comments. This jewelry is a lot of fun to make. Potato jewelry concept is very unique, economical and creative! 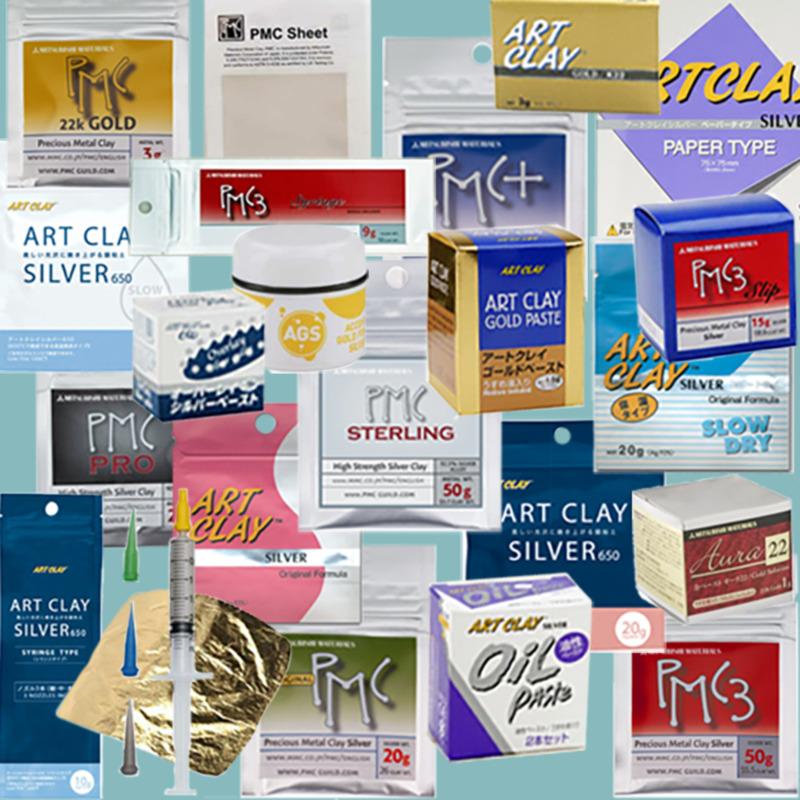 There are endless possibilities needed to be explored in the world of creative crafts! I am now into jewelry-designing course and studied the basics and details of this course with an ambition of becoming a professional jewelry-designer. Your hub is well-presented with a helpful video, clear instructions and eye-catching photos! Well-done! Thanks Torys Ten! I hope your daughters like the idea. You have the greatest ideas! I'll show my jewelry making daughters this. Thanks so much flash! I really appreciate it. These are fun and make great conversation pieces. Thanks so much nularej! Your seven year old will have lots of fun. My 7-year old daughter just saw your potato jewelry and she is wanting it badly... We'll totally give it a try over the weekend then. Also, I have pinned it to pinterest yesterday and got a lot of repins! I love the potato jewelry. Can't wait to try it myself! It's so fun to see the fun and creative things people come up with. Awesome hub! Thanks nylarej! The nice thing about this is you can start it and set it aside for a while. What an amazing and cool hub! How I wish I have spare time to do this again. 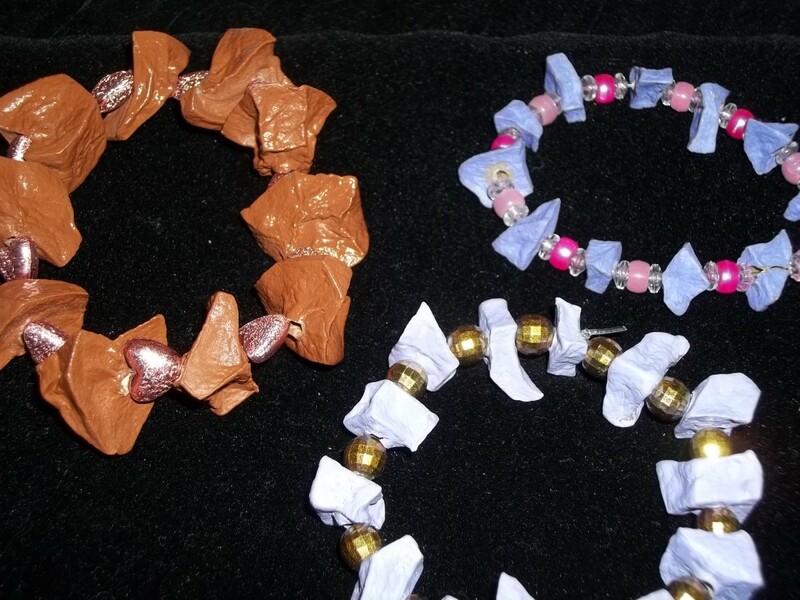 I used to make recyclable jewelries and wish I can get more time probably with my daughter. She'll surely love this! Thanks for the vote and share Movie Master! I can't wait to hear how your pieces turn out. I just can't wait to give this a go! what a fantastic idea! Thank you,voted up and shared. Thanks tillsontitan! I appreciate the votes and share! Chunky jewelry is everywhere and with a piece like this, if it gets lost or broken it really is no big deal. With some of the paint colors out there one could get really creative too. It is a little weird, but boy is it a conversation piece. Surprisingly, they only get an earthy smell and none of mine rotted, just got solid. The bigger pieces took longer to harden and they sure don't look pretty before they are painted. I always washed my hands after touching the potatoes. Thanks for commenting! Who would've thought? As you point out, this idea is very timely. Big, clunky jewelry is everywhere and seldom cheap. This is a great project, a great alternative to expensive jewelry and a creative hub. Voted up, useful, awesome, and interesting. Shared with my followers. I appreciate it lyricwriter. It's one of those funky things that was really fun to do. The results are pretty cool. Thanks so much jennzie! It is definitely a conversation piece. People get such a kick out of the fact that they are potatoes. Hi suzzycue - Not sure how long they last, but they are sealed and painted so I imagine a long time. The key is to make sure the potatoes are fully dried out before they are painted and sealed. Thanks for the visit. Ignugent - Thanks so much for the votes. I appreciate it. Thank you so much Suzie HQ! I'm glad you enjoyed it. It was fun to do. It is such a fun unique thing. Thanks Tammy. It was lots of fun to do. I appreciate your support. Hi barbergirl - I wondered about the dehydrator too, but since I don't have one I went the old fashioned route. Can you put the skewers in the dehydrator? I've never used one. I hope you give it a shot! Thanks. Glimmer, you're such a creative gal. Great job on directions and more. Never dreamed of such a thing. LOL Awesome idea! I would have never thought that you could make jewelry with potatoes! Very creative and cool idea. Voted up! I am in awe just like the other hubbers commenting here. How long do they last, a year, before they break down or do they stay exactly how you make them? Very Cool.